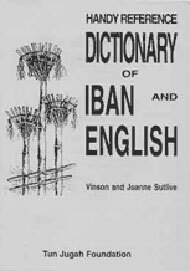 Handy Reference Dictionary of Iban and English. (1994) By Vinson H. Sutlive. Published by The Jugah Foundation. Includes most common Iban words with English equivalents and or explanations. Also includes most common and many scientific English words with Iban equivalents and or explanations. With an introduction of 60 pages, 925 pages with almost 50,000 entries. 13,000 Iban-English and 36,000 English-Iban. An indespensable tool for government personnel, businessmen, linguists, academicians, every student from primary to university, every library and home use.